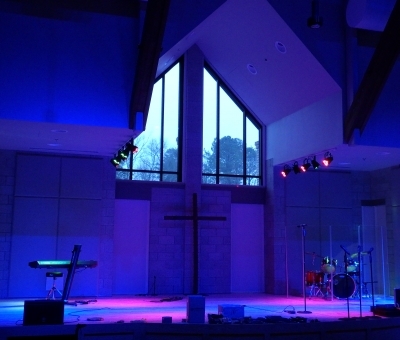 Clemson United Methodist Church - Productions Unlimited, Inc. | Productions Unlimited, Inc.
At Clemson United Methodist Church, Productions Unlimited completed a full lighting and audio/video design-build project in their new worship center. The new space was built to serve as a contemporary service venue, a performance venue, a dining facility, and a fully-functional gymnasium. 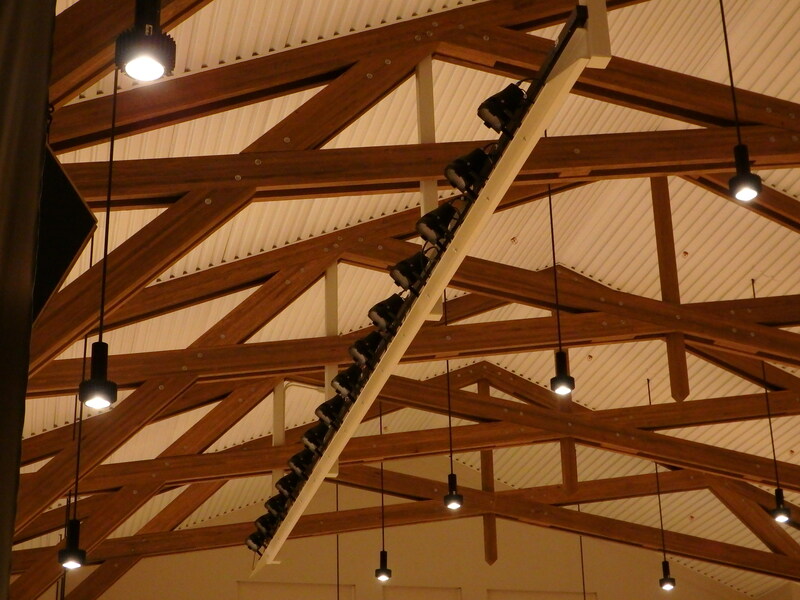 Working closely with the client, PUI designed and installed systems that exceeded their expectations. 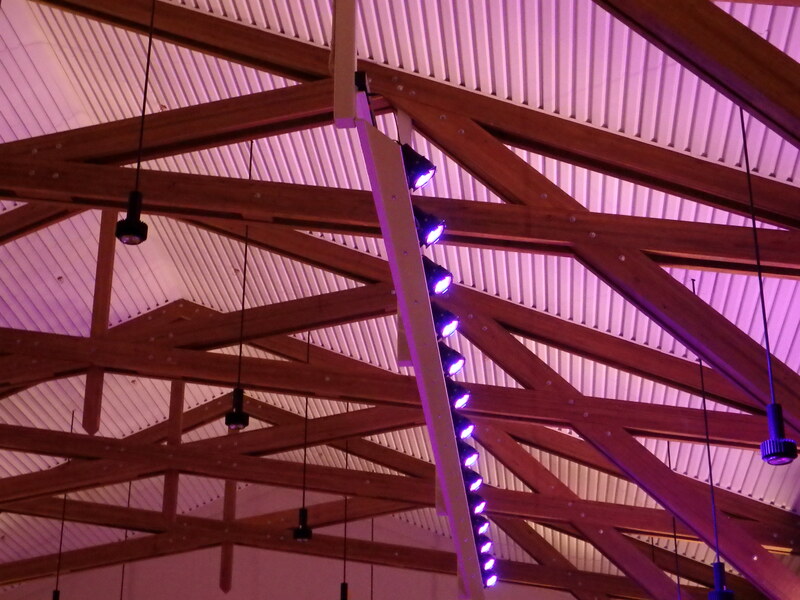 The new contemporary worship center incorporates LED lights including LED dimming pendant house lights from The Light Source, ETC Desire 40s as front lighting, ETC Desire 22s as top and accent lighting, and LED ArcSystem fixtures to accent the wood trusses in the space. 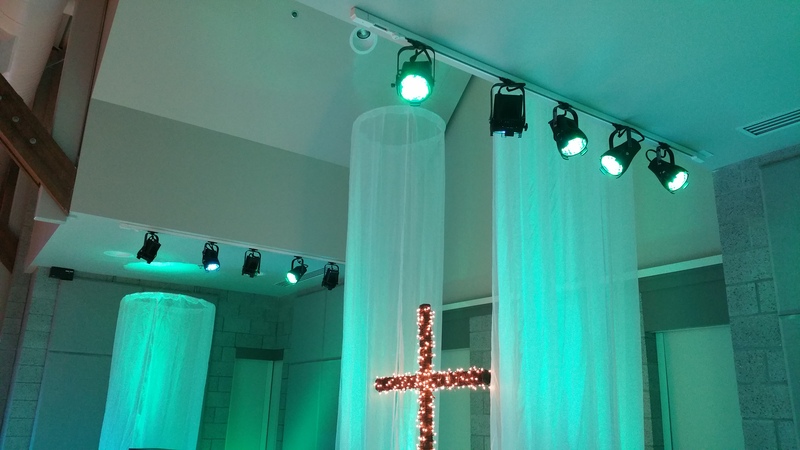 The ETC Desire 22s are mounted above the stage on tracks allowing for the church to have a great range of flexibility if there is a need to add or move any fixtures for a particular service or performance. 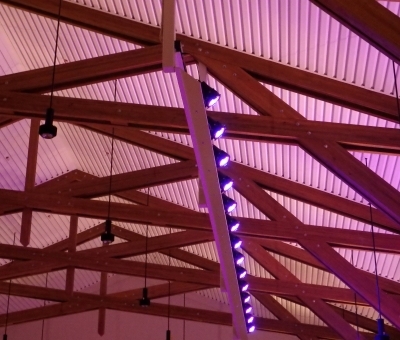 All the lighting is controlled by an ETC SmartFade ML board and a Paradigm Architectural Control System, which has an easy-to-learn direct-access style of operation. 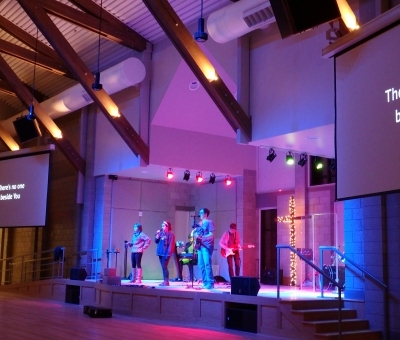 The church utilizes a full band for each Sunday service, and the client wanted both clarity and punch from their audio system. Danley SH60 boxes were chosen to serve as the mains, with a pair hung on either side of the stage. The box features two 12″ low frequency drivers, six 4″ mid-range drivers, and a single 1″ high frequency driver. Its ability to cover a large portion of the frequency spectrum combined with its high efficiency made the SH60 an ideal candidate. 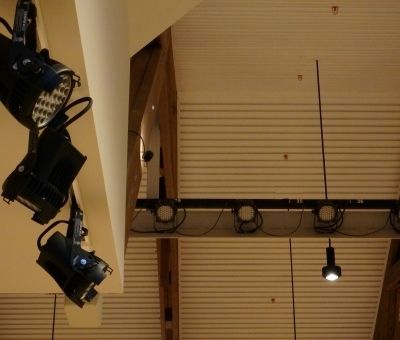 In order to provide sufficient low end, a Danley TH212 was mounted under either side of the stage. Each box features a pair of 12″ long excursion woofers that are capable of efficiently operating all the way down to 38Hz. 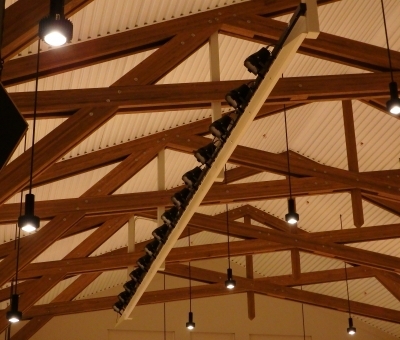 That capability, combined with the advanced acoustical designs Danley is known for, ensured that the system would not be lacking when it came to low end punch. 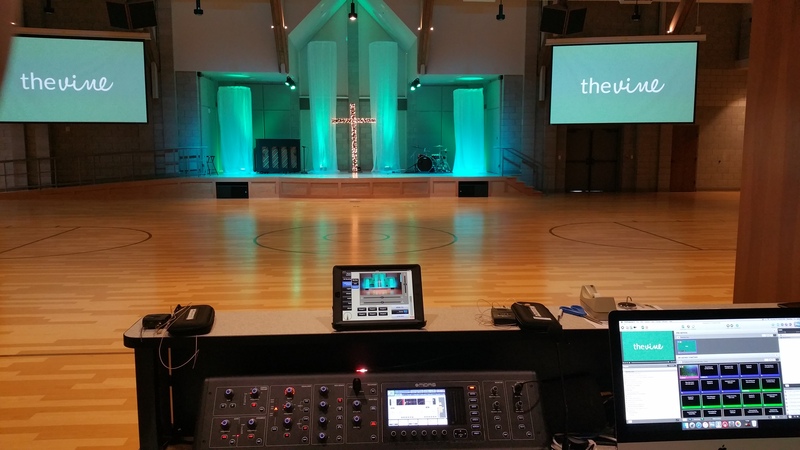 When it came to mixing consoles, the clients wanted something that was capable, intuitive, easy-to-use, and economical. The Midas M32 was a natural choice for a console that would meet those specifications. I/O for the console was provided by a mixture of analog lines, a Behringer S16 digital stage box, and a Midas DL251 digital stage box. The S16 was installed in the booth and handled all of the Sennheiser wireless microphones as well as the Sennheiser in-ear monitors. 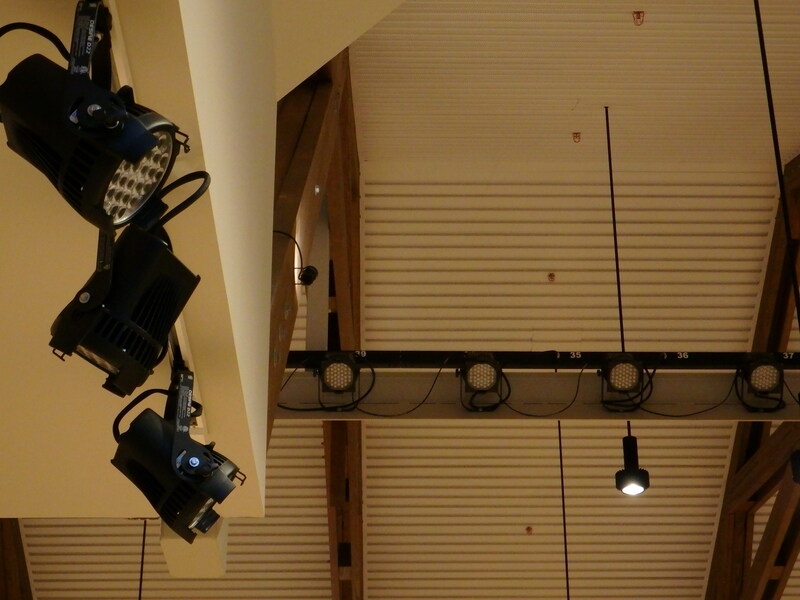 The DL251 was housed in the amplifier room and handled the routing of stage inputs and system outputs. Crown amplifiers were chosen to provide power to the system with processing from Biamp. The Crown DCi 4|1250 amplifiers were a perfect match for the Danley mains and subs because of their increased efficiency and power handling capability. Two amplifiers powered the SH60 boxes, while a third powered the sub boxes. 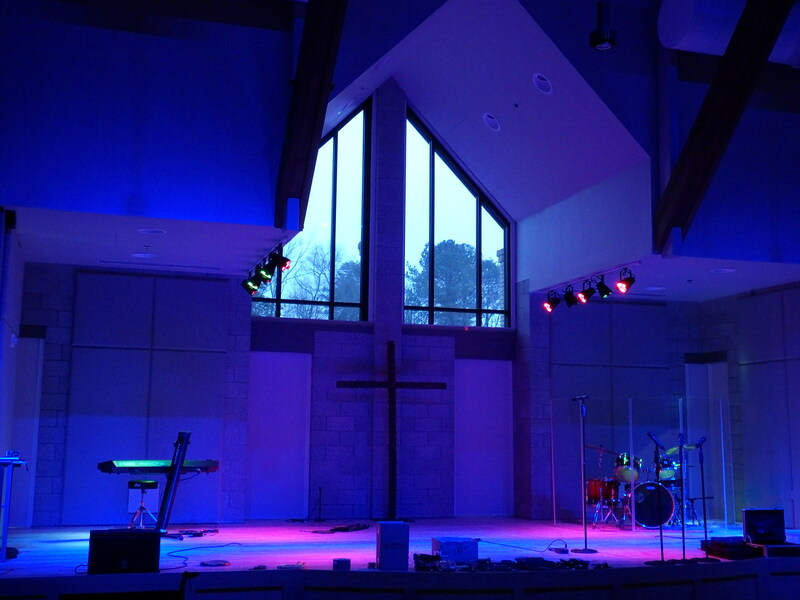 A fourth Crown amplifier, a DCi 4|600, was chosen to provide power for stage monitors and the program speaker system. All four amps were fed processed signal from a Biamp Tesira DSP. The Tesira is capable of processing up to 12 inputs and 8 outputs, and allows for complex signal routing as well as featuring a host of filters, EQs, compressors, and limiters. The Biamp DSP also played a critical role in allowing control of the system through Crestron components. It was important to the client for anyone to be able to come in and use the system for meetings and presentations without needing detailed knowledge of audio. 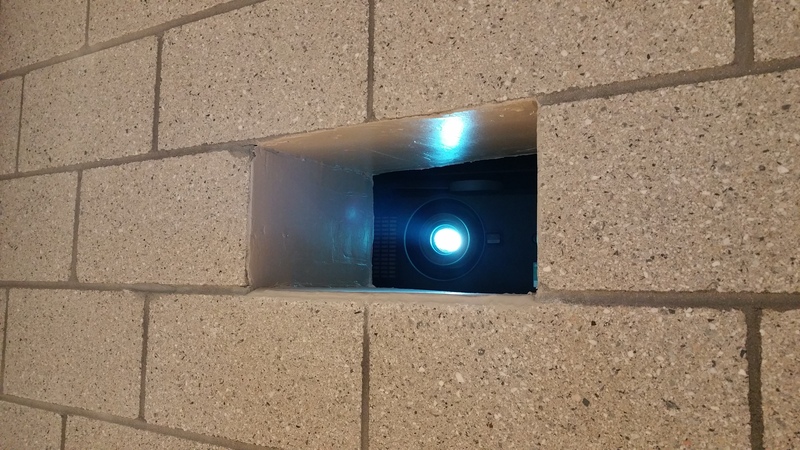 A simple press of a button changed the system from live mode to presentation mode, which bypassed the console and sent signal from two Sennheiser wireless systems and the video feed straight to the Biamp. Volume could then be controlled through one of the Crestron touch panels or an iPad app. For superb video quality, all the sources, intermediary devices, and displays have been carefully selected for 1080p60 high definition video, running over Crestron DigitalMedia infrastructure. 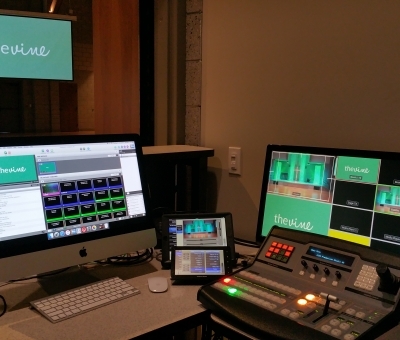 Video inputs at the stage and in the booth allow users to easily connect their own AV source devices such as laptops, tablets, cameras, etc. An Apple iMac, a Blu-ray player, a Vaddio PTZ camera, a Roland streaming device, and an AJA recording deck are also part of the system. The Vaddio camera can be operated from a dedicated control panel with full control of zoom, focus, and color balance, as well as speed-proportional motion control of all three axes simultaneously. Additionally, the camera can be controlled from the iPad or touchscreen as well. 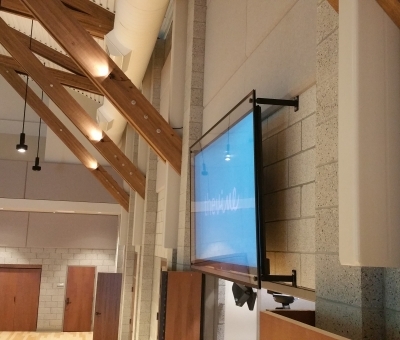 Any input can be routed to any display, and a Crestron control system allows for easy automated control of the video switcher as well as peripherals, audio, power circuits, lighting, and window shades. 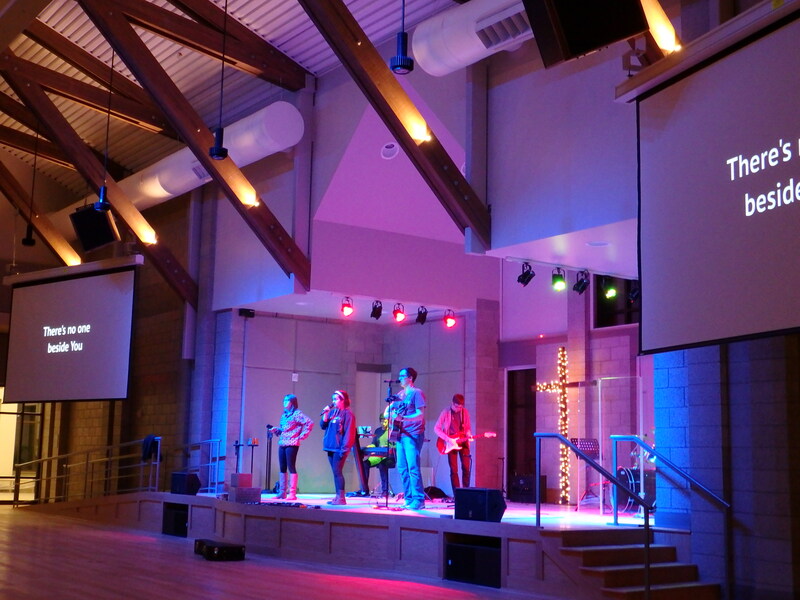 The two main displays are Digital Projection E-Vision 8,000-lumen 1080P HD projectors aimed at 90″ x 160″ screens. 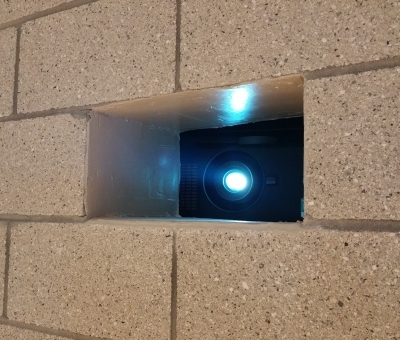 The projectors were discretely mounted in the adjacent storage rooms, with small cutouts in the wall for their images to shine through. 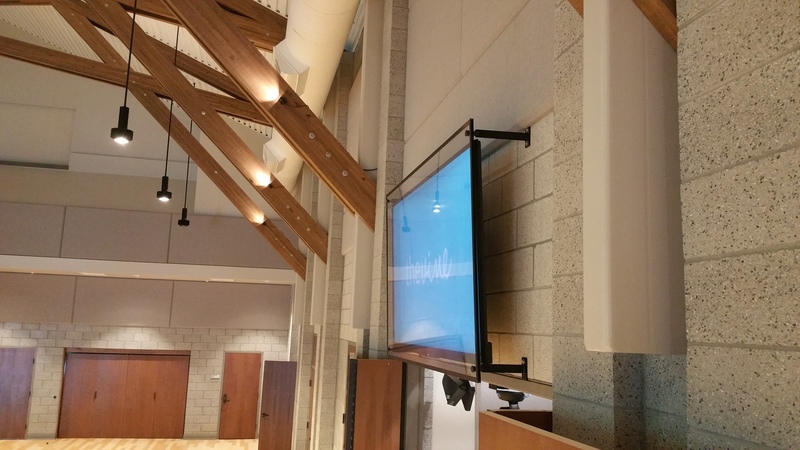 An 80″ display is mounted on the back wall, serving as a confidence monitor. Productions Unlimited, Inc. has fabricated a custom 3/8″ polycarbonate shield for the protection of the display since the space is also used as a basketball and volleyball court. 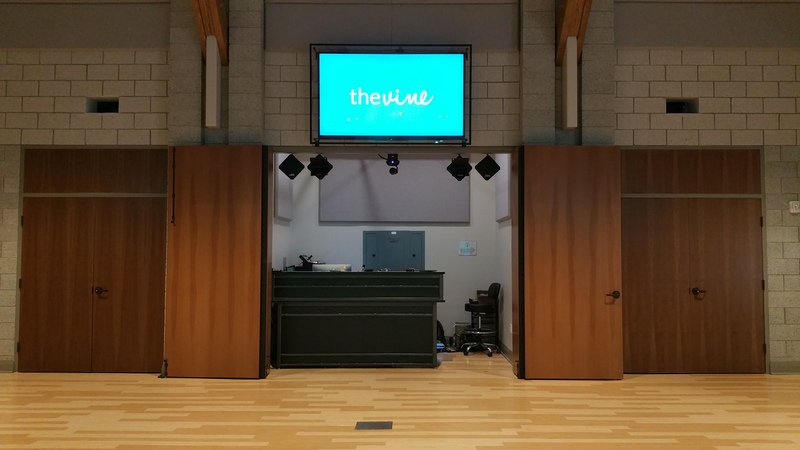 A 60″ display in the lobby serves as both digital signage and a program video feed from the performance space. 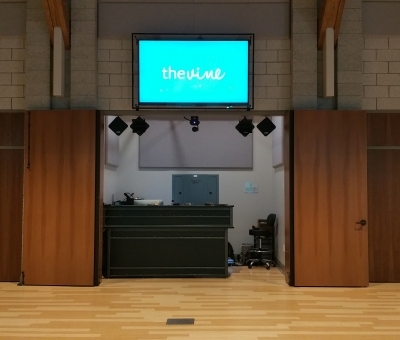 A 24″ LCD in the booth serves as a preview display for the operator. The system is complex, but the controls have been thought out to maximize the use of the system while keeping complexity to a minimum. 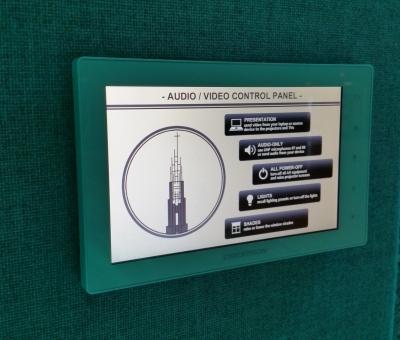 On the stage is a 7″ touchscreen, providing a simple interface and fully automated operation. 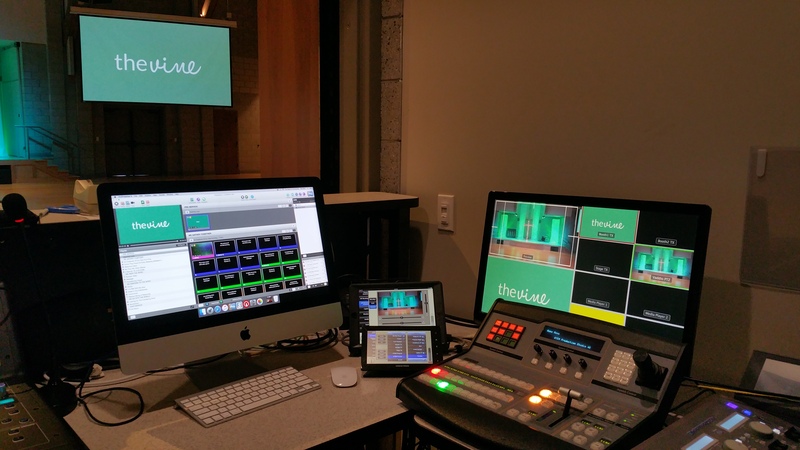 To power-on all the devices, lower the screens, and route video and audio from the stage input panel to all the displays, a user merely needs to push a single “BEGIN PRESENTATION” button. 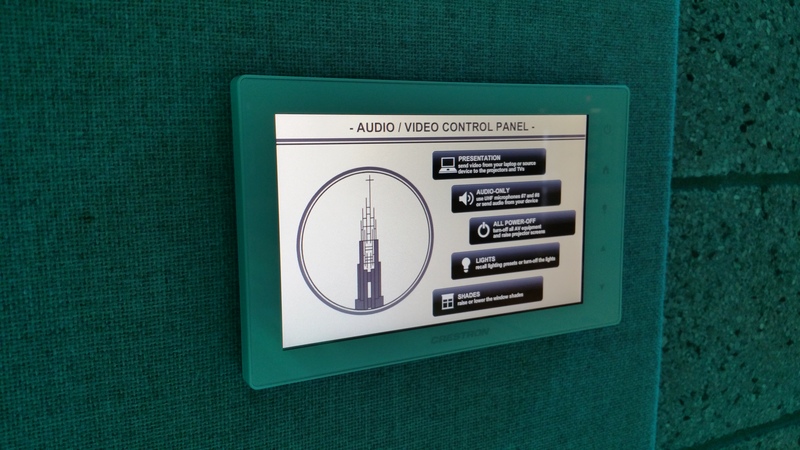 They can also control the window shades and lighting from this touchscreen. 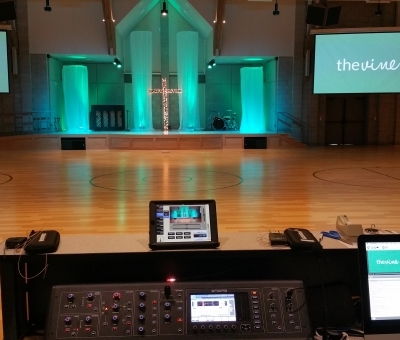 For the intermediate user, there is a 7″ touchscreen as well as an iPad in the booth which provide provide an intuitive interface and allow users to route video, adjust audio levels, recall lighting presets, open/close window shades, and control the camera and peripheral AV equipment. For the advanced user, there is a BlackMagic production switcher, allowing for full creative control of video mixing, including wipe/fade effects, chroma-keying, graphics overlaying, and more. 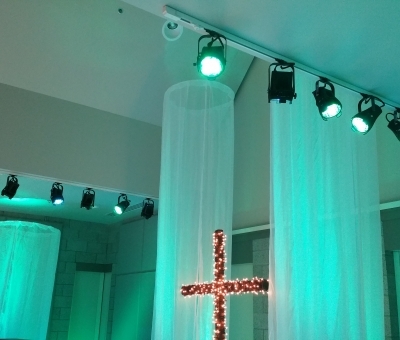 Productions Unlimited, Inc. has received an abundance of positive feedback from the staff at Clemson United Methodist Church and is proud to have been a part of this installation.